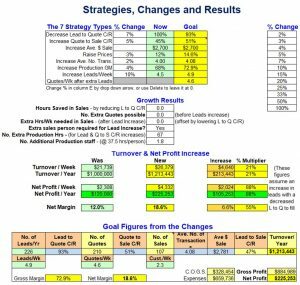 The Business Growth Planner is an excellent tool for your practice as well as for potential consulting work with your clients. It’s a simple, but powerful spreadsheet that produces very insightful, achievable financial goals – in under a minute. It’s often surprising what profit outcomes it reveals from filling it in. This tool is usually only included as one of 8 topics in the Academy of Business Mastery. That’s because it requires extensive education on the topic of strategies and their execution secrets to implement what those chosen in Business Growth Plan. Access the tool below with your contact details to receive it in your Inbox by email. Just like with any tool, the tool creator who uses it for years knows much more about it than a novice who just started using it. For this reason it’s recommended to book in for a chat about the tool which is also with my complements. Without more guidance and further discussion you probably won’t see the true benefits of this tool. Why is this Tool Free? I love seeing the difference some confidence and vision building has on business owners and that’s my whole aim by giving you this tool for free. The email you receive the tool from is also the one email all communication goes through so when you have questions, just reply to any email. I’ll receive it and reply within 24 hours.